electro-music.com :: View topic - VCF with voltage controlled resonance? VCF with voltage controlled resonance? Posted: Tue Mar 05, 2013 1:31 pm Post subject: VCF with voltage controlled resonance? I'm working on a poly synth based on Yusynth modules and want to have one VCF per voice. 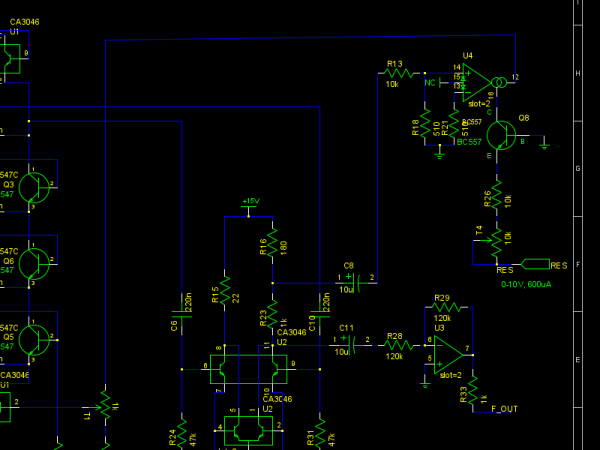 Problem is I want to have one resonance pot to control all the VCF's, but the resonance isn't voltage controlled. I'm looking at the minimoog VCF at the moment, but all the VCF's I've looked at seem to have the same issue with resonance. I was thinking about replacing the resonance pot in the circuit with an OTA based VCA. I was wondering if anyone has tried this and whether or not it was successful, or if there are any other options that I should consider? The LM13700 data sheet has an example of using it as a floating voltage controlled variable resistor, would that be a better option? Someone who knows what they're doing (ie. not me!) could gain some insight from those designs I suspect. The Yusynth ARP (edit: meant diode ladder) filter it looks like he's using a transistor to shunt the feedback to ground, that looks much simpler. He uses an FET to implement voltage-controlled resonance. Another approach would be to use vactrols in the feedback/resonance loop (although I've never tried it with vactrols but no reason why it wouldn't work). Oops, I said ARP filter in my previous post but meant the diode filter. The question is, do I do a diode filter instead of the Moog filter, or try to adapt the FET method to the Moog filter? I'm leaning towards the the Moog filter, but don't know if my analog circuit skills are quite up to the task of adapting the resonance control. Vactrols aren't a bad idea either, that would be pretty simple to implement. Only problem is I prefer to avoid them as they're not as easy to source as I'd like and a touch expensive. Would much rather keep everything on Mouser if I can. I have an idea that might work for you -- but I want to patch it up to test it out. I will get back to you later this evening. Any progress? I would love to get a better handle on this problem - there seems to be several ways to accomplish it. Hi , yes the EMS resonance control can be directly adapted to the Moog filter. Well, I took a stab at this with a JFET (2n5484) and 22uF cap I had handy. I removed the resonance pot and shorted the two leads together, attached the cap to that and the other end of the cap to the drain of the JFET. Source of JFET to ground. I was able to get some semblance of control but not entirely satisfactory. With the gate at 0 volts (JFET on, should be no resonance) I still got some resonance. With the gate at -15V (actually should be off around -3V so -15V should be more than enough) I got more resonance but couldn't get to self oscillation (even with the trimmer maxed out). So I dunno if the 2n5484 is not appropriate or if there's some other circuitry needed to address these issues or what. There is some other stuff in the EMS circuit that I couldn't really follow. Something else that occurred to me, when the JFET is on (0 resonance), wouldn't it have a negative side effect of bleeding off some of the output? I played around with it a little more and can get self oscillation without a problem now , so the off state of the JFET seems to be working. I checked the on resistance of the 2n5484 and it was nearly 300 ohms which explains why I couldn't get the resonance all the way "off". I swapped it out for a j112 which has an on resistance of 30 ohms and works quite a bit better. I still feel like there's a little more resonance than I'd like though. Well I downloaded LTSpice to experiment some more (haven't used spice in quite a while). Looks like the 20uF cap is too small and makes a good amount of low end roll off, a 220uF seems to work better (500uF is even better but might be getting a little out of hand practically speaking). Adjusting R29 from 180 to 140 and adding a 1k resistor where the emphasis pot would go seems to help, though it looks like it adds a little overall gain which can probably be compensated by the output buffer if needed. Looks pretty close in the simulation. I didn't test all these changes on my protoype but as close as I'm getting, I'm not sure I'd notice the difference if I wasn't doing a side by side comparison. However, I also simulated a solution using an OTA as a VCA to control the feedback. This really flattens out the response below the cuttoff when resonance is off, and provides a nice peak as it's turned on. I'll have to try a prototype, but at this point I think I'm going to go with the OTA solution, though I'm a little irked at the prospect of only using one half of a LM13700. If you're not too picky, the JFET solution works well and is pretty simple. Sounds promising. Looking forward to hearing how you sort it out. I eventually want to implement CV resonance for Yves' 4072 filter, but it has been pushed onto the back burner for now. I finally built up a board with the moog vcf + OTA controlled res and an OTA based VCA on the final output. And it seems to be working well. The resonance - not so much. I looked at the waveform out of the filter and it looks pretty wacky (the VCO signal going into it looks perfect). But then I checked the spice sim and the output looks pretty similar so maybe that's just the way the filter affects the signal I'll have to compare it with my original filter board build. Might just need some more trimming, or troubleshooting the board itself. DIY etching SMT PCB dual sided with 8mil traces and tiny vias is not fun. Hopefully fabbed boards won't give me this much trouble. That sounds great, I'm looking to do the same mod to mine. Any chance you could put up a partial schematic showing the mods you've made with resistor and values etc? Iabc needs to range from 0 (no resonance) to about 600uA (self osc.). Resonance control input PNP and resistors are setup to give that with a 0 - 10V CV, a different CV range may require some adjustment of the values. I'm tempted to utilize the on board buffer to reduce the Iabc required but I think I'll stick with what I have for now and see how it works out. Many thanks for sharing, I will breadboard this up with my vcf and see how it goes. Any further updates guys? I was doing a bunch of LTSpice simulation back in April but had to switch to a project with a real deadline, so am just revisiting this now. Time to start breadboarding I suppose. I'm still using the circuit I posted above, seems to work fine. For the control voltage, I used a linear 500k pot with a 100k resistor between the wiper and V+ lug to get a reverse log response (0-10V CV range). Is T1 (the 1K trimmer) directly in the feedback path? 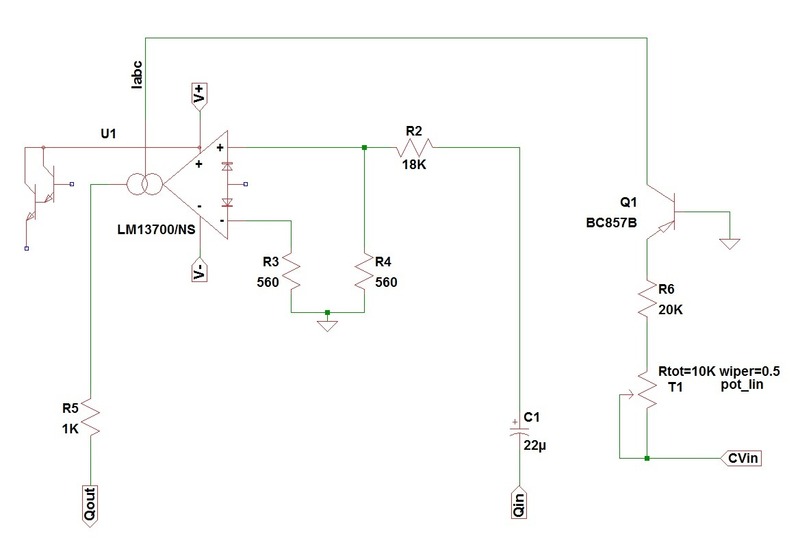 Is that the only component that does the current to voltage conversion from the LM13700? Is there a specific reason you did not use the darlington pair buffer? I'm realizing there are many many ways to skin this cat, so am curious to hear about the rationale behind specific approaches. Yep, I just went straight to the trimmer to keep things as simple as possible. As I mentioned earlier, it results in Iabc needing to be a little higher than I'd like and I've considered using the buffer so I can reduce that, but it's working fine so far so I've been putting my efforts elsewhere. And yes, when it comes to electronic circuits there are always many solutions to a problem. I bread boarded gdavis' LM13700-based VC resonance design. A bit of tweaking and it is working well with the 4072 filter. I had to change R6 to 68K to get an appropriate response on the breadboard, despite 20K working fine in the LTSpice model to get a proper 0-10V response. Nice solution. Im planning to build something similar to you, but instead of pots feeding cv to the filter i'm planning to control it from a microcontroller. All my pots are buffered to distribute the CV's to 8 voices. Other CV sources include an 8 channel DAC driven by a mico-controller for key CV's, analog envelope generators and analog LFO. These other sources are mixed with DC VCA's and sent to one of the filters frequency inputs while the buffered pot frequency CV is connected to the other frequency input. So the "base" frequency is set by the pot (which could easily be replaced with uC driven DAC) and modulated by the other sources.